The sky isn't falling. Comparisons of the past 16 months with any figures since the housing collapse are meaningless. Sure, ad income has nosedived -- what hasn't? The sky isn't falling? Wow. I don't think any reasonable person would call those comparisons "meaningless," regardless of the housing collapse. It's called Craigslist... welcome to the 21st century. Goodbye paper wasters! The first comment is typical of someone in the newspaper industry. They are keeping their eyes tightly shut, holding dearly to the belief that things will turn around and that future generations will "want something to hold in their hands." People still want news, just not necessarily newspapers. Are you getting my drift, anonymous? Or are you just another top-level management oldie with nothing new in their bag? Not meaningless but it simply shows that advertiser preferences are not in print news anymore. It's another nail in the coffin of the newspaper business. The news business is alive and well... just not for newspapers. Wow. I wish I had this post before I posted my rant on John Sturm's advertorial on "The reality of newspapers." I would have definitely cited it. Nice work. I would just like to say most of this is the newspapers fault. I tried to put an ad in the paper and they screwed it up twice. I wanted it in the paper for two weeks but because of the errors only got it in two days. $600 for two wks $130 for two days. The paper lost $470. They need to get their act together. From the looks of it, one can make a good case that the sky began falling in 2006. However one looks at it, the size of the drop in this most recent quarter is extraordinary. The decline of the newspapers is as natural as the decline of the record player or the type writer. Great Journalism and reporting will always be needed but, the content delivery method and business models need to adapt just as you have adapted from the SF Chronicle to this great blog. The newspapers execs have a lot to learn from you, my friend. Then what is it that just landed on me and my newspaper colleagues? We have had a nearly 50 percent staff cut (last year) and will receive an approximately 20 percent pay cut this year. A significant portion of the pay cut will be permanent. So something just fell on top of my career and those of many who I work(ed) with. But I guess we won't really know whether it is our universe collapsing or some random piece of space junk until about 24 months out from the economic recovery. That's when we will find out how much, if any, advertising will return. In that is the hard reality of this advertising downturn. Most of what is being lost today -- especially in classified ads -- will not return to newspapers in any form. By the time this is all done, industry analysts full expect that those "fallen away" advertisers will have discovered other means to deliver their messages. Those other means will be both cheaper and more efficient. Upside for all those who pooh-pooh the doom and gloom? It will be too late for Chicken Little then. That's fully in line with halving of advertising revenue that was observed in the 1930's recession: [purplemotes.net]. person complaining about screwed-up ad cites a common experience with customers of print. cutting staff (both in number and experience) inevitably leads to diminished quality. we've all witnessed the same thing, from the smallest to the biggest newspaper. instead of investing in a high-quality product, news execs find new ways to produce edit (and advertising) on the cheap. it's detroit responding to japanese imports with pintos and vegas and gremlins and pacers. once you start turning tricks to make your numbers, it's hard to regain your rep. here's why the sky is falling now: we're witnessing a perfect storm of 1) economic decline caused by a generation of stupid policies, made worse by the pointless war in Iraq, 2) the acceptance of new technologies that have, for now, excited businesses, with the yet-unproven promise of targeting consumers, 3) the sorry legacy of profit-sucking chain ownership of newspapers, aided and abetted by corruption in d.c. and on wall street. i believe we will see a dramatic shake-out in the industry, and once-prestigious titles will disappear. but quality newspapers -- newspapers with strong and courageous leadership able to withstand the pressure to panic -- will survive and, in the future, will thrive. Anonymous HHC asked how much of the downturn is due to loss of papers and subscribers. My study on this is at www.cjr.org. Ad revenue per print subscriber peaked in 2006 (in current dollars) at $925. Inflation-adjusted, the peak was in 2000, just before the end of the dot.com boom. That and demographic trends had combined to push employment ads to new heights, but they crashed in print and on line in 2001 and never recovered. Craigslist had nothing to do with it. Nothing. The rise of the Internet had little or nothing to do with the long term circulation decline (which was entirely due to demise of afternoon papers until 2006, when the industry restated its faked circulation numbers). The data is obvious. JUST LOOK AT IT. The quarterly ad revenue declines are in line with the economy's declines (car sales off 40%, ad volume off 40% and so forth) but the dailies' declines are MUCH WORSE than declines in TV and radio. I'd like to offer another POV on the craigslist vs. newspaper classified issue. It is not the web service that killed the class ads as the major source of profit; rather -- it was the newspapers that had enjoyed (read: exploited) a tremendous monopoly on local personal and commercial advertising as long as they could. They should be happy that they could have gotten away with it for so long. The "wanted" and "for sale" announcements used to be free, posted on lamp polls, window displays and church doors. Cragslist simply restored the time-old tradition and the internal logic of such advertising. For those of us who follow newspapers and try to look at the industry strategically, this collapse is no surprise except to those who believe their own propaganda. For example, "As an unregulated monopoly, we own 4% of the local economy." Or, "As people age, they become newspaper readers." Both of these statements are, and have been since at least 2000, demonstrably false. But, believing them is ultimately fatal. Some of us who do business appraisals of newspaper companies struggled with the high multiples paid by the newspaper groups for acquisitions. What an amazing lack of understanding of cost of capital! So, the Q1 2009 numbers are so bad that they are below the lowest value likely to occur if they are following the trends as adjusted by the current economic condition. I must confess, I did not consider the war in Iraq. I don't know what to do with that. I keep seeing the term "news business" cited in these responses, especially by those making proclamations such as "the newspaper is dead, but the news business is not." They forget the defintion of a business - at least in modern capitalist societies - is an enterprise that offers a service for a profit. Once the possibility of profit disappears, so will the news business that has provided the quality and range of journalism this nation has come to expect. Some of those cheering the possible end of newspapers and legacy newsrooms have yet to make that connection. And please don't tell me some of the nonprofit and "non-traditional" online news operations that have sprung up in the last year can fill that void. Anyone making that claim has never seen the legal fees newspapers routinely pay form things like forcing a city or federal administration to comply with a FOIA request. What the blogophiles seem to forget is that most of the information, issues and ideas they like to debate and expand on were first reported by a legacy newsroom somewhere, usually by a newspaper. I believe the newspaper industry will eventually find a new model - and, yes, the paper edition may become a specialty item. They already are moving to charge for their websites (See the recent Philly Enq subscription notice). It will be smaller, for sure. Their customers will be a much smaller slice of the American population because, tellingly, that is the percentage of our nation that cares enough about news (as opposed to headlines) to pay for it. That's just the next 800-pound gorilla waiting on the edge of the current storm. I worked for a print media company for a number of years before being let go a couple months ago. I can honestly say that I, and most of my co-workers saw this coming two years ago, but the higher ups at our company decided that it was nothing, and sales would rebound. They could have diversified then, but they didn't. Now, they are scrambling to get into the online sales business, but it's too late. I'm sure my former company will have to let go more people, and will probably not be around in a year or two. Newspapers are dead, and there is nothing anyone (save the government) can do to keep them going. Like someone earlier said, it's old media, like the record player or VHS tapes. The internet is the place to go for news. If newspapers want to stay around, they need to revamp their approach. Start by putting more time and money into your online spaces. Become the only source of news in your local area. And put the emphasis on local stories. Yes, you can have national stories on the site, but make sure you are spending most of your resources on the local angles. Finally, I'm sorry, but printing a newspaper everyday is just not going to work anymore. Readership is down, advertising is down, you need to trim costs. Publish only one or two times a week, and feature well written articles that can only be seen in the paper. The only way to get your favorite news would be to pay an online subscription. I'd pay it. I'd pay it. Then the good papers with the good content could syndicate it, for a fee potentially. I mentioned this to our publisher yesterday. She didn't miss a beat: "Wait until you see the second quarter!" But the state of California's suffering the worst tax revenues since the 1930s and the governor is seriously proposing to end welfare payments to millions of families. It's hard to parse out which crisis is the Internet and which is the economy, but the combination is murder. Much of this decline IS from Craigslist. And eBay. And cars.com. And hundreds of other online sites that have taken over the old classified ad business. Ask any newspaper publisher how much their classified revenues have fallen in the past 5-10 years, and they'll tell you 80-90 percent. That, more than anything else, is what crippled the newspaper business. The recent bad economy only made things worse by gutting display ads for cars, real estate and department stores. But this problem is not fixable. Classifieds are gone. Newspapers will exist only online in a decade as older people who refuse to use computers die off or finally learn to use computers. With no classified revenue, we simply can no longer afford to print the paper on dead trees and drive it to your house every day. Look, the NAA's own statistics show classified ad revenue for dailies increasing from $12.5 billion in 1994 to $14.2 billion in 2007. In constant dollars, 2006 classified ad revenue was the same as in 1994... and that's with 8% fewer newspaper titles and almost 20% fewer readers. Now, explain again the Craigslist effect. What effect? So... if newspaper publishers say their classified revenue has fallen 80-90%, they know about as much about numbers as the reporters they hire. Without having read it yet in its entirety, what immediately jumped out at me is that the data go through 2007. And the data is on the downswing since 2000. It seems to me if there is a free and easy replacement for newspaper classifieds, a vicious recession could be just what is needed to swing many people and businesses over to start using it. This is likely especially true since craigslist is really getting established now in many micro markets, whereas ealier they tended to be focused on major metros. Now that I've read it (and it is quite short), you could argue the data does suggest Craigslist is a growing problem. How do you know the declines since 2000 are not exacerbated by Craigslist? Jeez, Steve, it's hard to argue with those numbers -- in that light, your comment sounds on point. But I've been hearing for at least 3-4 years from newspaper executives who were aghast at what they saw happening to classifieds. They weren't making it up. They saw this developing in the numbers every quarter. And you make your point using 2007 numbers. What about 2008? What about 2009, which is halfway over? What about 2010? In 2007, Craigslist was nowhere near as pervasive as it is today. If I had a dollar for every time in the last year I've heard someone refer to putting something on Craigslist or buying something off Craigslist, I'd be -- well, I'd have a lot of dollars. You may be right in your 1994/2007 comparison. But the trend line is moving in the wrong direction, and tell me what is going to reverse it? I have a chart showing what happens when I choose other starting and ending points up through 2007. There's a natural business cycle and results bounce up and down cyclically, with the one exception of employment ads falling in 2000-2001. The academic economic literature had predicted it would happen -- live births had fallen from 4 million a year in the US to 3.2 million starting in 1974 and continuing into the early 1980s, so the cohort of people entering the workforce in the 1990s was smaller than normal, so more recruitment was going on. When newspaper job classified fell, so did Monster.com volume -- revenue there dropped from $1.4 billion to under $900 million in 2000-2001. They actually lost share to newspapers, but papers' ad managers bailed out Monster.com by partnering with it! Newspapers all through the 1990s to the present time maximized ad revenue by raising prices and thus forfeiting share. Perfectly reasonable strategy in the short term, not so good long-term. But overall ad volume per subscriber continued to rise until 3Q2007 in current dollars. Economists (NOW they tell us...) say the recession began 4Q 2007. Advertising volume is a leading indicator, so one could reasonably expect that the recession caused the decline. But let's say that ALL the decline in TOTAL (not per-subscriber) revenue from 2004 thru end of 2007 was due to Craigslist alone. That's a stretch. There are several measures you could use. Again, total ad volume per subscriber peaked in 2006 in current and inflated dollars. Or use TOTAL AD DOLLARS (the peak was in 2004 in deflated dollars, 2005 in current dollars) as the starting point for losses. Again, some was really due to circulation drop, the circ reporting scandal, editorial quality drop, the shuttering of many local advertisers and so forth. But let's say it was ALL due to online. That fall, from 2004 to 2007 in absolute dollars was 7%. Since then, the fall has been 40%. So for every dollar that conceivably was lost to online, $5 or $6 was lost to the recession! Thus, the immediate solution, as I see it, is to survive until business turns up. As a former J-school prof, and as a citizen, I of course hope that we evolve solutions that will also enhance journalistic quality and help insulate it more from the business cycle (by broadening the base of paid products and services journalism offers). But most of the ideas I see seem devoid of basic knowledge about how we got here in the first place! How do you know where you're going if you don't know where you've been? The situation concerning who grabbed revenue (or created new ad revenue) is complex. My suspicion is that Craigslist hurts the pennysavers a lot more than dailies. It is also clear that "google" type ads -- click-through payments rather than free or per-word charge -- created entirely new ad revenue and new marketing opportunities. On behalf of owners of several dailies, in the 1998-2002 timeframe, I tried to track total media "classified" ad revenue in several mid-size local markets. Typically, the daily had about half the market's ad volume (lineage and number of placements) but 70-80% of the revenue. Gannett and to some extent Knight-Ridder (with the hyphen then...) in those days would ring even a small metro area with smaller properties (often weeklies) and the weeklies' web sites began taking ad insertion volume from dailies in the 15,000 to 60,000 circulation range. Those dailies sometimes responded by seeking to add circulation in the weeklies' readership areas. It's an expensive proposition. I tried to get my handful of newspaper clients interested in doing google-type ad sales -- ads priced per-inquiry -- but they wouldn't play that game. They were worried about cannibalizing their existing ad base and making a hash of existing sales staff compensation plans, even though they had already foregone the opportunity for per-inquiry revenue to Google. One client set up a separate ad sales agency to sell the PI's, with modest success. Dailies had a bigger problem -- the whole industry had become so over-leveraged that any spare money (and there was a lot of it) went to pay debt and dividends. As late as 3Q2007, dailies enjoyed operating profit of 18-20 percent (Wall Street said 18, but many privately held properties did better). All of that profit was going to service debt, not enhance the core business. 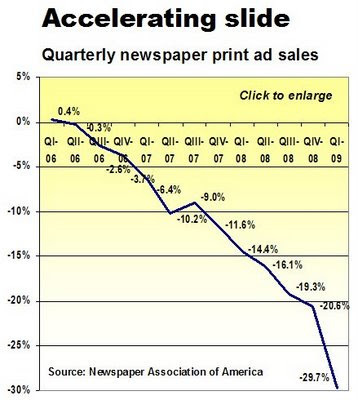 In the next 4 quarters (by 3Q2008), newspaper ad revenue was cut 18 percent! The flight to Chapter 11 was the result. In general, the dailies should emerge MUCH stronger from the recession because they have the opportunity to shed much of the crushing debt load. But again, if the owners (and wall Street analysts) think they are in a doomed industry, they will milk their properties instead of putting some of the profits into strengthening them. Many of you are correct. The Internet and the economy have teamed up as serial killers of many industries. However, in the case of the newspapers, it is mostly the economy and an inability to adapt to a modern business plan that will be the ultimate case of death and these issues go back before the mortgage meltdown. It's bad this is happening, but the advertising industry is evolving. TV killed the radio stars :), internet is killing the print media and in 20 years will kill the TV broadcaster who won't be early adopters of new technologies. I help bad and sorry for guys working in print, but at least there will be less paper waste. It seems the print industry may be on it's last legs, considering how much of their expenses are subsidized by advertising revenues. Now, with print news readership lower than ever, corporations hurting from major drops in consumer spending, and the majority of young people angry with the increasingly liberal slant of the news industry, newspapers no longer have a place in society. It's not profitable to print news anymore, it's less convenient than surfing the web, and it's less immediate. I'd like to see data on "majority of young people angry with the increasingly liberal slant of the news industry." I'm a data guy. And I have trouble even defining the terms LIBERAL and CONSERVATIVE, let alone polling people to find out what they are. Then again, I don't consider the demonstrable lies on data-free Fox and 90% data-free MSNBC to be "news" at all. I hope newspapers never sink that low... and I fear they will.